Search Minerals Commences Drilling … | Search Minerals Inc.
TORONTO, Oct. 5, 2012 /CNW/ - Search Minerals Inc. (“Search” or the “Company”) (TSXV: SMY) and its wholly-owned subsidiary, Alterra Resources Inc., are pleased to announce the start of a $250,000 Phase I program which includes a 1200 m NQ drilling program (the “Drilling Program”) on the Pesky Hill prospect, located 25 km southeast of Port Hope Simpson, Labrador, in the Port Hope Simpson REE District, as announced on September 5, 2012. Identify a high grade, Dysprosium resource that can be put into production much quicker and at a substantially lower capital cost than the Company’s Foxtrot Project resource. Test the earlier prospecting and surface sampling, which yielded Dysprosium values of 621 - 2,741 ppm (Dy203 from 713 - 3,157 ppm), (News Release, March 1, 2012). Demonstrate to all stakeholders the potential of the Port Hope Simpson REE District for multiple REE deposits. Springdale Forest Resources (Diamond Drilling Division) has been contracted to carry out the drilling program targeting HREE-Zr-Y-Nb mineralization at the Pesky Hill prospect. Approximately 25 holes (25 to 50 m depth) will be spotted to trace and sample high grade mafic-rich, amphibole-pyroxene-quartz-titanite, and related granitic pegmatites (see Search’s news releases, March 1, 2012). Logging, sampling and assaying of drill core will be on-going with the Drilling Program; assay results are expected in the near future. Core is transported from the drill site to the nearby road and transported by truck to Search’s Port Hope Simpson base. The core is split in half using a diamond table saw. One half of the core is kept in core boxes in the core storage facility for reference, and the other half is packaged and transported to ActLabs Sample Preparation Lab at Goose Bay. Search representatives maintain custody of the core and samples at all times until they have been delivered to the lab. See Search’s July 27, 2010 news release for details of the preparation and assay methods. The Strategic Committee continues to work with Byron Capital to explore strategic alternatives for the Company to enhance shareholder value. Search is expecting an updated NI 43-101 resource estimate to 450m depth for its flagship property, Foxtrot. The Port Hope Simpson REE District is 135 km long and 4 - 12 km wide, consists of 3910 claims and occupies 978 square kilometres. There is a total of 11 REE prospects in the District, including: Rock Rolling Hill, Rattling Bog Hill, Piperstock Hill, Southern Shore, Toots Cove, Pesky Hill, HighREE Island, Foxtrot Project, Foxy Lady, Fox Pond and Ocean View. The Foxtrot Project, Foxy Lady and Fox Pond Prospects occur in the Fox Harbour mineralized belt. Piperstock Hill, Southern Shore, Toots Cove and Pesky Hill occur in a 13 km mineralized zone known as the HighREE Hills. The Ocean View Prospect occurs in a 3 km mineralized zone known as the Ocean View mineralized belt. The Fox Harbour, Ocean View and HighREE Hills mineralized zones are considered very prospective for both HREEs and LREEs. Search Minerals Inc. (TSXV:SMY) is a TSX Venture Exchange listed company, headquartered in Vancouver, B.C. Search is the discoverer of the Port Hope Simpson REE District, a highly prospective light and heavy REE belt located in southeast Labrador. The company controls a dominant land position in a belt 135km long and up to 12km wide. 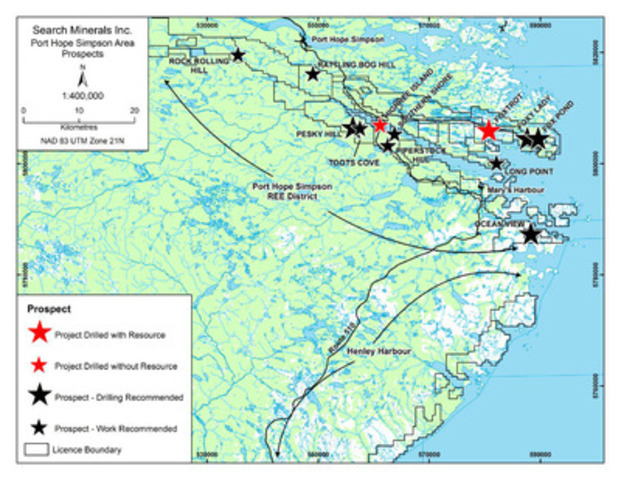 In addition, Search has a number of other mineral prospects in its portfolio located in Newfoundland and Labrador, including a number of claims in the Strange Lake Complex, where Quest Rare Minerals has an earn-in agreement with the Company; and at the Red Wine Complex, where Great Western Minerals Group has a Joint Venture with the Company.